Bleeding Edge is a shell script designed for Ubuntu 32 bit. 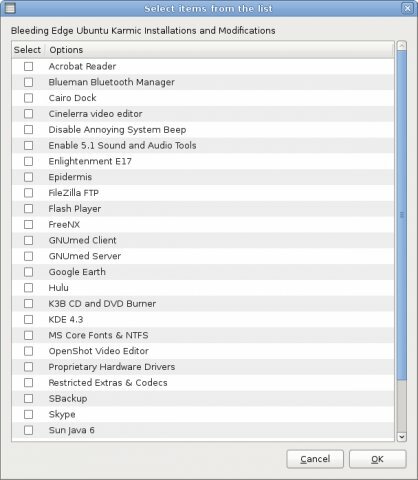 It installs repositories, keys, and software -- such as media players, codecs, MS fonts, drivers, etc. It also cleans up the system. Unfortunately it only works with Ubuntu 10.10. Judging by the console errors that flash past it is a script written that uses bash-specific functions. Running “sudo sh” on Ubuntu runs dash which is *NOT* Bash and runs only standard sh syntax. Yes, this script, when examined in a simple text editor like Leafpad, clearly says it is designed to work with Maverick (10.10).